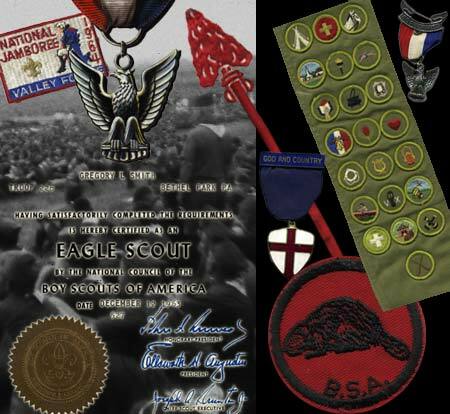 Eagle Scout at age 14! I went from a compulsive overachiever to an apathetic underachiever in just 43 years! Membership in Order of the Arrow proved elusive in improving my credit rating. Troop 228, George..'Shabosh Shabosh'.. McIntyre, was our scoutmaster. My first patrol leader was Dave Good. I have fond memories of Father and Son campouts. Mom still laughs at my return from 'Operation Deep Freeze'. We camped out in a sub-zero January and basically huddled around fires to keep from freezing. When Mom unrolled by sleeping bag, she found two socks frozen in the shape of boots. One note of trivia, Rick Sebak was also in Troop 228. He makes those great nostalgia shows for WQED. Also in our troop were my brother, Brad Smith, and saxophonist Robbie Klein, both Eagle scouts. I attended the Valley Forge Jamboree in 1964 and was a Viet Nam war protester only 4 years later in 1967. After spending many hours outdoors both as a Boy Scout and infantryman in the National Guard, I have come to appreciate the GREAT INDOORS.